The legend of Lord Rama and Ramnaam are the very souls of the entire Bharatvarsha. Every part of the Ramkatha, i.e. the story of Lord Rama, right from his birth in the Tretayuga till the slaying of Ravana in Lanka with his glories are recounted, narrated and liked in every nook and corner of India. MaryadaPurushaarth! MoortimantSayyam! The one Who adheres to the value of restrain, an epitome of morality – Shree Ram is the deity of millions of Indians and his tales act as guiding principles in the life. Ramayana, the Vedic sacred scripture that unfolds all attributes and aspects of Lord Rama holds importance not only in Indian culture but South and South East Asian countries as well. Not just the countries of Indian subcontinent such as Sri Lanka and Myanmar but the countries such as Indonesia, Thailand, Cambodia, Malaysia, Laos and Philippines, outside the continent, too perceive the stories of Rama and adapt them into their plays and dances. Moreover, the images of Rama, Janaki and Laxman are engraved in several ancient monuments in Italy. Shedding light on the significance of Ramnaam, Sadguru Shree Aniruddha said, “Ramnaam can wipe off the greatest sin; likewise Ramnaam can redeem any worst sinner leading him to the right path. In the sacred book, Ramrasayan, written by Bapu, he has portrayed the entire journey of Lord Rama’s life in such a way that Shraddhavans can visualise it, understanding the importance of Ramnaam and Ramayana, both. He has also elucidated the virtues, morals and conduct of Lord Rama through it. Lord Rama, (God’s incarnation in human form), was born on the Shuddha Navami of Chaitra, i.e. the ninth day of Chaitra Shubhankara Navratri which is celebrated as ‘Ramnavami’. This day is considered to be extremely pious. This Utsav is celebrated with great fervour in India, the divine land where Lord Shree Rama was born. Every year, Sadguru Shree Aniruddha Upasana Trust, Shree Aniruddha Upasana Foundation along with other associated organisations conduct this Utsav in a very devotional environment wherein a large number of Shraddhavans pour in to witness and experience it. The holy fire of ‘Shree Sairam-Sahastra-Yagya’ is ignited with ‘Deepshikha’. Shraddhavans can offer ‘Aapattinivaarak Samidha’ to this yagya. Taarak Mantra is also chanted throughout. Shraddhavans firmly believe that their mind and prana (life forces) receives positive energy and the sins of their previous birth are effaced, on performing this yagya. 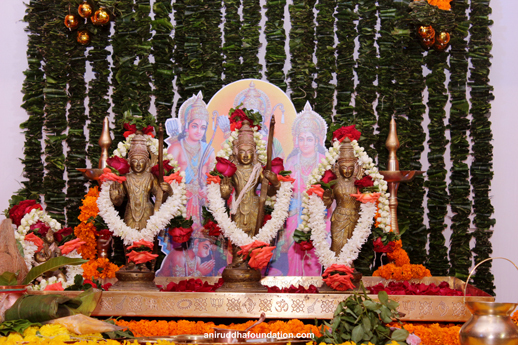 Shree Ramvardayini Aadimata Mahishasurmardini is worshipped during the Ramnavami Utsav. The story of how Mahishasurmardini acquired the name-‘RamvardayiniDurga’ is mentioned in Ramayana. A vivid description of the same can be read in Matruvatsalya Vindanam, the Grantha penned by Sadguru Shree Aniruddha. ‘When the war between Lord Shree Rama and Ravana became more intense and fierce, at that time, Hanuman instructed Lord Rama to chant Adimata’s ‘Ashubhnashini Stavanam’. Later, at the stroke of midnight, Ashtadashabhooja Mahishasurmardini manifested on the battlefield and blessed Lord Rama proclaiming, ‘May Lord Shree Ram be victorious!’. True to the blessing, Lord Rama, indeed triumphed, killing Ravana. Aadimata who then, assumed the form of Tripuramba Mahishasurmardini, granted the boon, Ramo Rajamani Sada Vijayate and slowly disappeared. Owing to this boon, Ramnaam became the Taarak (Saviour) Mantra, and this form of Mahishasurmardini is revered as ‘Ramvardayini Durga’. 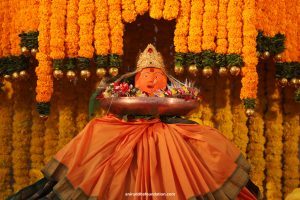 During the Ram Navami Utsav, Renukamata in the form of the Taandala (sculpture of her face) is worshipped at the venue. On its arrival, the Taandala (sculpture of Renukamata’s face) is first worshipped at the entrance and then welcomed joyfully with chants in praise of her amidst beats of traditional musical instruments followed by Shodashopcharapoojan (16 step or way worship) and Sahastradhara Abhishek (consecration). The vessel used for this Abhishek (Abhishek Patra) is in the shape of a Cow’s udder which causes the water to flow through many streams; hence the name, Sahastradhara Abhishek (consecration through hundred streams). After that, Renukamata’s aarti is sung. ‘May we be blessed with the love of Renukamata as Lord Shree Parshurama received’, is the prayer that everyone offers at her feet. The highlight of Ramnavami is the ceremony of Lord Rama’s birth. As per the guidance from Param Pujya Sadguru Shree Aniruddha, the birth of Shree Ram (Ramjanma) is traditionally celebrated in the afternoon. The crib or cradle, used in this ceremony is the one used by Sadguru Shree Aniruddha during his childhood. Each Shraddhavan sings the traditional verse “Kuni Govind ghya, Kuni Gopal ghya” with the “Palana”. This is followed by the naming ceremony, announcing the name ‘Shree Ram’. ‘Sunthavada’ (a mixture of sugar and dried ginger powder) is also distributed as prasad. Shraddhavans are able to take the glorious darshan of the crib and also the symbolic representation of Shree Ram placed inside it. 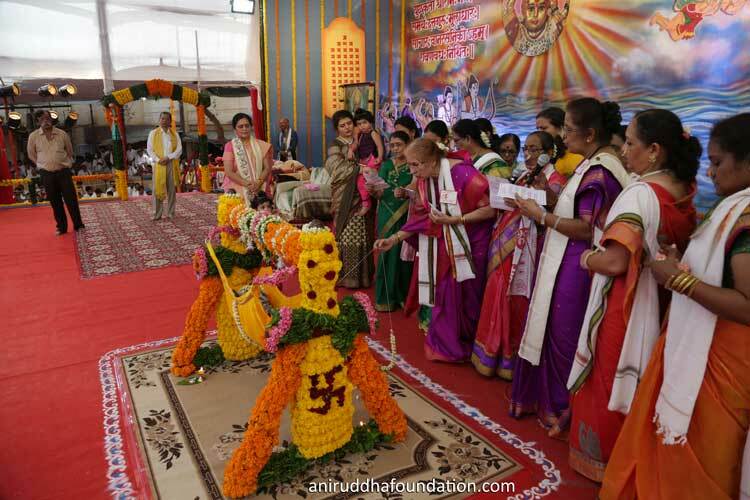 ’Shree Sai ‘Saisatpujan’ is also performed during the Utsav. Saibaba had handed over the three things viz. Rudrakshamala, Trishool (trident) and Shaligram to Shree Hemadpant, the author of Sai Satcharitra, These three things are brought from Sai Niwas to the venue of the Utsav and are worshipped with love. Following this worship, ‘Shree Ghorkashtoddharan Stotra’ is chanted throughout. Furthermore, Shree Sainath Mahimna-Abhishek is performed on the Shree Sai Sadashiv idol. Here, every Shraddhavan is able to perform a symbolic Pujabhishek (worship and consecration). Shraddhavans believe that this Abhishek(consecration) is beneficial for the health of every family member, primarily for children in the family. When a Shraddhavan performs the Talibharan in the atmosphere filled with the chants of ‘Raksh Raksh Sainath, Shree Sairam’ and sounds of auspicious instruments, he seeks blessings and earns the merit of anna-daan, and thus Shraddhavans can be seen participating in the Talibharan with all their heart. At the venue, the mantra ‘Om Ramay Rambhadray Ramchandraya Namah’ is chanted continuously throughout the day. Here, Shraddhavans, while chanting the mantra, apply abeer or bukka) on each other’s forehead and do namaskar. A Shraddhavan applies bukka to another Shraddhavan, considering him to be the form of great devotee Pundalik whereas the Shraddhavan, on the other side, to whom the bukka is applied, considers the hands of Shraddhavan applying bukka to be the hands of Pundalik, such is their belief and faith. During the Utsav, continuous reading of one chapter from Shree Sai-Satcharitra is done collectively. This section is called ‘Sai Satcharitra Adhyayan Kaksh’ or even the Adyapipa Kaksh. ‘Aadyapipa’ means ‘Shree Sureshchandra Pandurang Dattopadhye’ who was an ardent devout of Shree Sainath and a great Shraddhavan of Sadguru Shree Aniruddha. He used to complete his Shree Sai Satcharitra recitation (parayan) on the four pious occasions of ‘Ramnavami’, ‘Gurupournima’, ‘Janmashtami’ and Dussehra’ every year. The significance of completing the recitation on these days can be found in Shree Sai Satcharitra. He had religiously been following this for 60 years. Indeed, the verse from the 11th chapter of Shree Sai Satcharitra, ‘You will receive seamless Ram’ (‘अखंड राम लाधाल’) became a reality of his life. Every Shraddhavan who enters this section reads Shree Sai Satcharitra with a resolve to become a complete Shraddhavan like Aadyapipa. While explaining his Panch Gurus (Five Gurus) briefly, Sadguru Shree Aniruddha clarified that ‘Shree Ram’ is his Karta Guru and that any of his work attains success, with Lord Rama’s grace. That Shraddhavans should worship Ram and pursue his devotion and love, is what Sadguru Shree Aniruddha yearns for. Undoubtedly, ‘Ram-Janmotsav’ is one of the sources or mediums. Further, he has provided Shraddhavans with lot more. 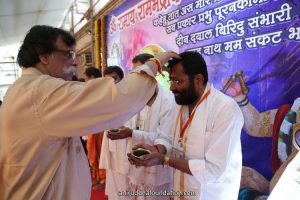 Sadguru Shree Aniruddha has explained the meaning of the Ramraksha Stotra several times in his discourses and has provided guidance on how to imbibe the core essence of it in our lives. The verses of Sunderkand magnificently describe Lord Rama and Hanumanta. He has also emphasized on the benefits of reciting the Sundarkand, many a time. Owing to this, the Sundarkand Pathan Saptah was organized by our Sanstha. Citing the verses from Sundarkand, Sadguru Shree Aniruddha, through his lucid and enlightening editorials titled ‘Tulsipatra’ in the daily ‘Pratyaksha’, has been imparting the knowledge to lead a life full of devotion. This editorial series has been long running for many years. To defeat the Kali and escape the vicious circles of Prarabdha (ill-fate), Sadguru Shree Aniruddha has given a sovereign remedy in the form of the Ramnaam Book. Shraddhavans submit this Ramnaam Book to the ‘Aniruddha’s Universal Bank of Ramnaam’ after the completion of various japs or chants in it. ‘It is only this bank that prospers our life in the truest sense and that Mahapran Hanumanta, very effortlessly builds a Setu and bridges the gaps across all of the births on writing this book, is a firm conviction of Shraddhavans. This Ramnaam Book is now also available in the form of an App on Google Playstore. In this way, Sadguru Shree Aniruddha sustains devotion towards Lord Rama in the hearts of Shraddhavans. On the night of the Ramnavami Utsav, the Sairam Sahastra-yagya gets concluded, and the Maha-aarti marks the completion of Ramnavami Utsav. Every Shraddhavan attending the Utsav leaves for home determined to adopt ‘Aniruddha Maha-vakyam’ (mentioned below) in his life.